Goodrich Ave. is undoubtedly one of St. Louis Park’s most historic streets. It is located in the neighborhood known before World War II as the “Center,” now known as Elmwood, and has some of the city’s oldest houses. There were two prominent Goodrich men active in the founding of St. Louis Park, Calvin and George. It was probably named for Calvin, as he was the President of the St. Louis Park Land and Improvement Co. that owned the land. The name of the street was not changed when most others were in 1933. It is interesting to note that Goodrich was not included in the original 1887 plat of St. Louis Park Centre. Its wide boulevards and the fact that Village founder Joseph Hamilton lived there indicate that it was a prestige location in the early years of St. Louis Park. In fact, the list of names of the families that lived on Goodrich make up a veritable “who’s who” of Park’s prominent citizens before the War. Unfortunately, many of the turn-of-the-last century homes have been lost. The neighborhood is now an interesting mix of Victorian and Postwar houses. The following is a list of those homes, with the year built and any history available about the home or the families that lived in them. PLEASE NOTE: Addresses have changed over the years, so there is a great possibility of error. If you have any additions or corrections – and especially photos – please contact us. 5713 Goodrich: Probably a turn-of-the-last-century home; the 1933 directory gives this as the address of Harry and John O. Hembre, and also John Webster. The current house was built in 1952. 5719 Goodrich: The 1933 directory lists this as the address of John F. Peterson. The current house was built in 1959. 5724 Goodrich: Charles “Pete” Williams built this house in 1945. When he retired as Fire Chief in 1969 it became the home of his daughter and son-in-law, Robert and McElmurry. Bob was killed in the Pizza House fire in 1971 and Mary and her children sold the house in 1976. In 2011 the house was demolished to make way for the expanded Fire Station #1. 5800 Goodrich: 1920. Once the home of the Renner family. From 1959-61 this was the address given for London Construction. 5801 Goodrich: 1900. One former resident was a man named Fuller, General Superintendant of Monitor Drill. 5806 Goodrich: Built in 1923. In 1944 this became the home of Duane L. Johnson. Duane’s grandson Ben purchased the home in 2011. 5812 Goodrich: The 1930 Census shows this address as the home of Alton R. Munson, a very early pilot. 5809 Goodrich: Built in 1912. In 1914 it was the home of John J. and Gertrude McCarthy. John was a mail clerk in 1930. Son Keith would go on to help start McCarthy’s Restaurant. Other sons were Graydon, Dennis, and Meredith. The family owned the house until at least 1940. The house still stands and is now a duplex. 5819 Goodrich: Built in 1910. In 1933 this was the address of the Village librarian, Mrs. Thomas Johnson. 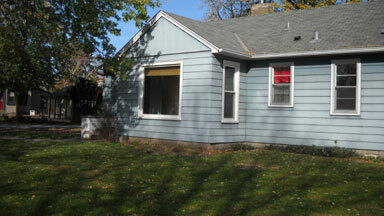 The Olson family bought the house in the early 1940s for $3,000 cash. It had no heat, and there was a foot of ice in the basement. The family lived there until 1973. 5825 Goodrich: Current house built in 1940. Once the home of Rev. Pierce and his sister. 5826 Goodrich: Built in 1890. The 1933 gives this address for three people, including Darrow Sewall. 5900 Goodrich: Built in 1898, this was the home of Joseph Hamilton. The name over the front door was “Sunnyside.” Click on the Hamilton link above for a historic photo of the house. 5906 Goodrich: The 1933 directory gave this as the address of Robert G. Forsyth. The current house was built in 1956. 5909 Goodrich: The Census lists Henry R. Jensen, who worked at the creosote plant, at this address in 1930. There is no house by that address now. 5911 Goodrich: In 1930 this was given as the address of Clarence J. Glick, a gravel pit screener. There is no house by that address now. 5912 Goodrich: This was the home of Village councilman Wolford. The current house was built in 1941. 5913 Goodrich: Follow the link for residents and photos. 5922 Goodrich: In the 1933 directory, this was give as the address of J.B. Schultze, clerk for St. Louis Park schools. On this site today is the house at 3771 Alabama, built in 1994. 5924 Goodrich: As with 5922, this is not an address today. In 1933 it was the home of Warren Sewall. 6001 Goodrich: 1915. The home of Mr. Trenkley, who ran the General Store on Walker Street. 6010 Goodrich: Built in 1910. At some point this was the home of the Hembre family. In 1930 the owner is shown as Roy R. Johnson. 6013 Goodrich: Built in 1893. In 1930 it was the home of Lars M. Johnson, who worked on Village roads. 6018 Goodrich: Built in 1898, this was the home of Doc Brown and his family. Doc ran a barber shop and pool hall on Walker Street. In 1933 it was the home of C. Sewall. Click on the Brown link above to see a historic photo of the home. Ben Brown says that 6018 and 6022 Goodrich were exactly alike. 6022 Goodrich: 1889. In 1933 this was the home Alec Larson. Ben Brown says that 6018 and 6022 Goodrich were exactly alike. 6024 Goodrich: 1900. The 1933 directory lists Rebecca Hamilton and Miss H.A. Hunter. 6207 Goodrich: Built in 1908, this became the home of Charles Hamilton, son of Joseph, in 1912. Also seen as 6211. 6212 Goodrich: This is a private home built in 1898, but there were businesses run here, unless the addresses changed. This was the home of the Frank Bradley family and the headquarters of the Bradley family’s businesses. 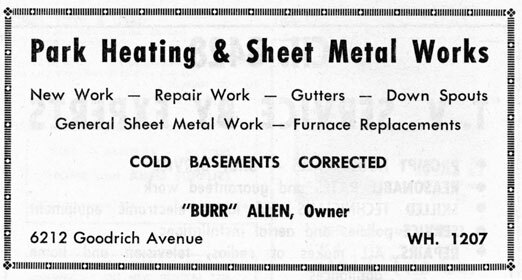 From about 1949 to at least 1960, “Burr” Allen ran Park Sheet Metal, then Park Heating and Sheet Metal Works, then Park Heating Specialties out of the building. 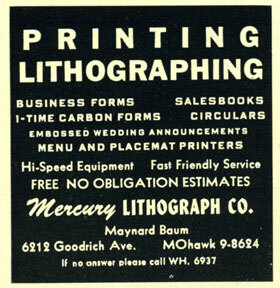 In 1954 this was the address given as Mercury Lithograph Co. In 1960 an ad at this address is for Allen Sales and Repair Service/Park Heating Specialties. 6219 Goodrich: 1940. Home of the Hofstrand family. 6300 Goodrich: 1926. Now known as 3770 Colorado Ave. Traveling west on Goodrich you will run into railroad tracks and a dead end. There is evidence that Goodrich went under the tracks, through to Skunk Hollow as late as 1971. Before the railroad tracks were put in in around 1913, 12 houses known as the Monitor Houses were hauled up Goodrich to present-day Colorado Ave. The following addresses are not in the city’s database today. They may have been renumbered as 3831 Edgewood, which was built in 1961. 6417 Goodrich: Automate Associates, manufacturer of precision parts and connectors. Robert L. Brown, president (25 employees) (1971). 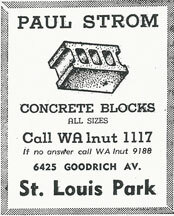 6425 Goodrich: Strom Block Co., Inc. (1951-1959). 1971: Daufelt Industries, metal finishing job shop, Robert J. Paterson, Jr., President (15 employees). 6437 Goodrich: Lee Holm Manufacturing Co., George O. Holm, president (1971). Manufactured plastic picture frames. Al Hartman says that this company was only there for around 3-5 years. “They originally got an old plastics injection mold machine and had my father work on it until they got it to do what they wanted. They then made plastic picture frames of varying quality and sold them, via mail order mostly, to photographers and anyone else who wanted them. The advertised in magazines such as Popular Mechanics.” In 2005, Cronstrom’s is listed at that address. 6441 Goodrich: Grant Battery Sales, Division of ESB, Philadelphia (1971). Clyde L. Wilkinson, marketing manager (12 employees).